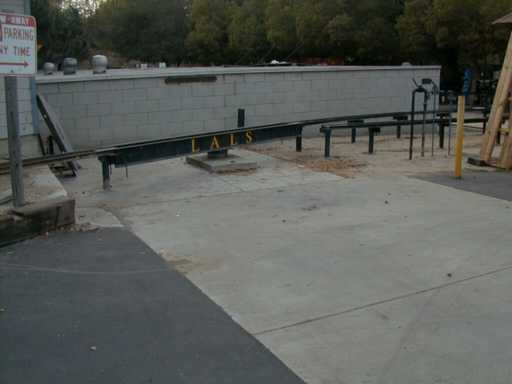 The LALS facility is built in a grassy park area with large trees and abundant shade. 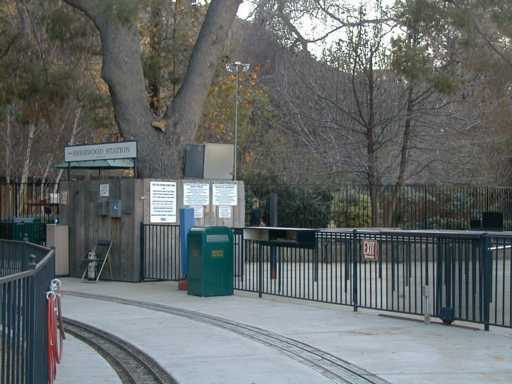 The facility is located between Travel Town and the Los Angeles Zoo. Due to its inland location next to the LA river at the mouth of the San Fernando valley, it can get quite hot in the summer. The shade is very welcome. The day I was there, "June Gloom" abounded, it was overcast and cool. This will change soon. New Sherwood Station is where the public accesses the trains. It has its own entrance to the facility with public parking just east of the gate. There are two tracks, the left one is usually used for steam equipment as there is boiler water available on that track. The two tracks can hold two or three trains each so that almost continuous loading and unloading is possible, and often needed. This is the side of New Sherwood Station that the public sees. The large scale layout is just off to the right, viewable through a fence. This is the original Sherwood station. Its primary purpose now is for loading and unloading of the 1" scale lines on meet days. 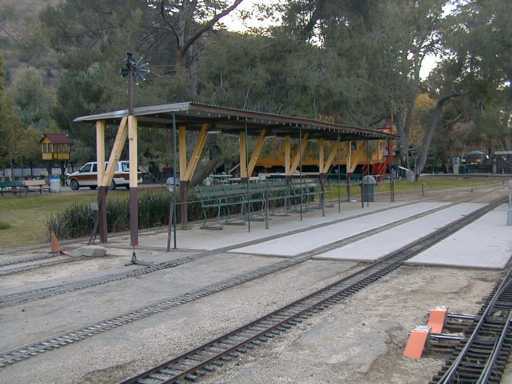 Before New Sherwood Station was built, Sutchville Station was the primary loading area for the public as it serves both the 1" and 1-1/2" scale lines. However due to the marginal stability of 1" scale rolling stock, the public isn't hauled on the 1" stuff anymore. Sutchville Station is right in the middle of the facility so that it made crowd control difficult. New Sherwood is in a corner of the park, near adequate parking, so it makes crowd control much easier. Utility stands such as this one stand all around the facility. 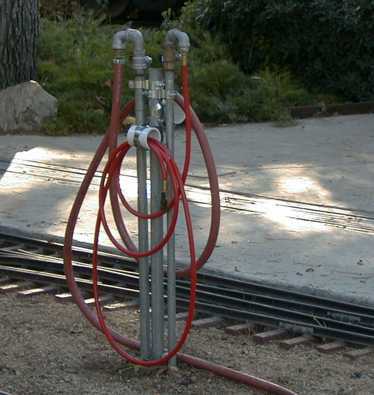 This stand provides city water, treated boiler water and compressed air to service the steam engines. 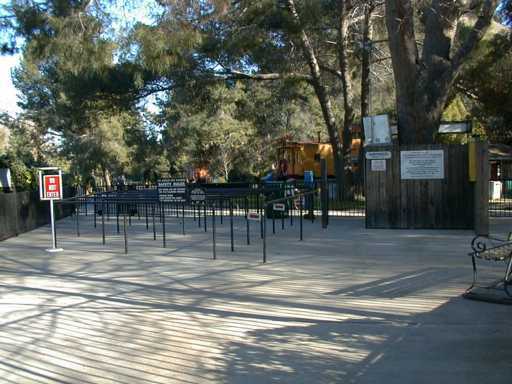 The 1 inch scale lines run around the main part of the park, inside the 1 1/2" scale lines which also run around a much larger loop in another part of the park. A new car barn was recently completed that holds trains on three levels. The lowest level tracks have direct access to the outside. 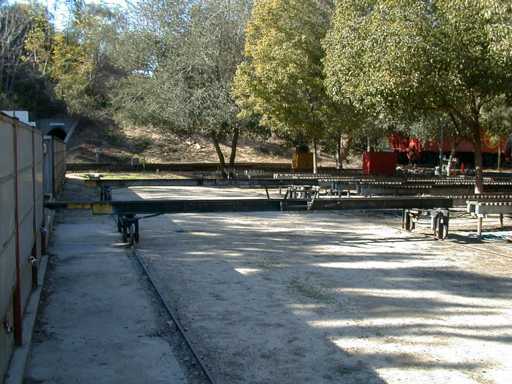 On the other side of the barn, there is a jack and a three level transfer table so that users of the upper level tracks can remove their equipment. 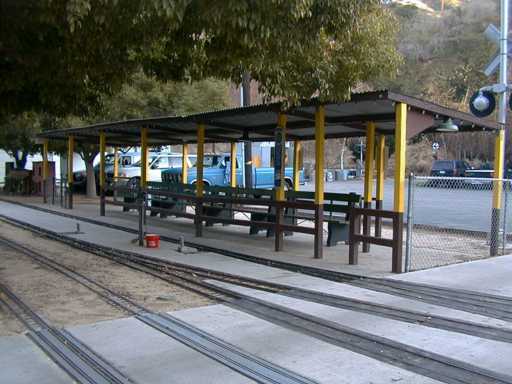 The club owns 20 or more riding cars and cabooses. The riding cars hold 3 adults each and a caboose is usually used by a conductor who watches over the train when hauling the public. Club riding cars can be used by anybody for hauling the public. These club owned cars are stored on six covered tracks behind the old car barns. Bad order cars are also kept here. 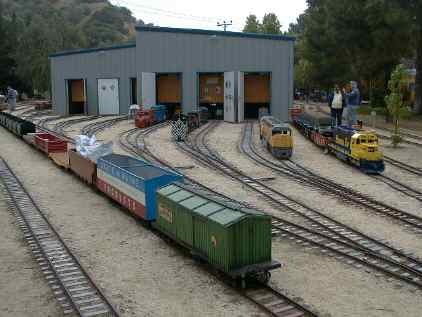 The old car barns are in front of a pair of transfer table tracks leading to the steamup bays. The two transfer tables are long enough to hold an engine and tender or riding car and sometimes another car as well. 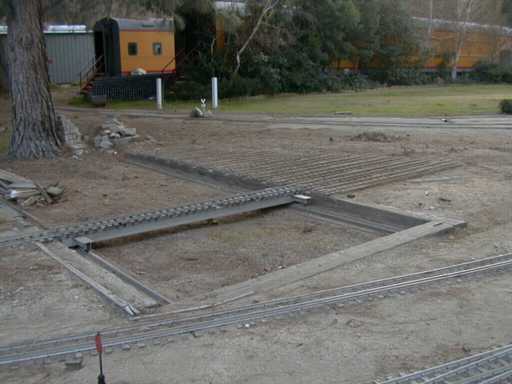 They can be moved to any storage track, the loading jack, any steamup track or to the inbound or outbound tracks. 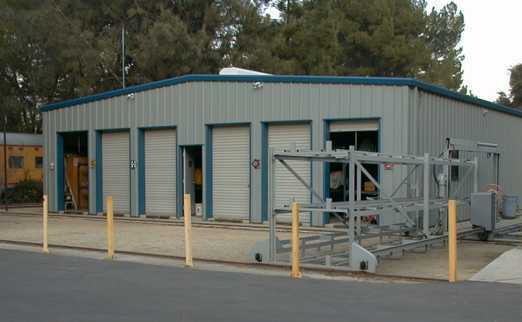 To facilitate loading and unloading equipment from trucks and vans, a hydraulic jack can be accessed from both the steamup bays and a track that goes behind the car barns. The jack table can also be used as a turntable. These are the steamup bays near the old car barn. The steamup bays are located in the shade of some large trees. The excursion train that was running is stopped at the "station" at one end of the property. This train was so long, that the engines have almost disappeared in the distance. 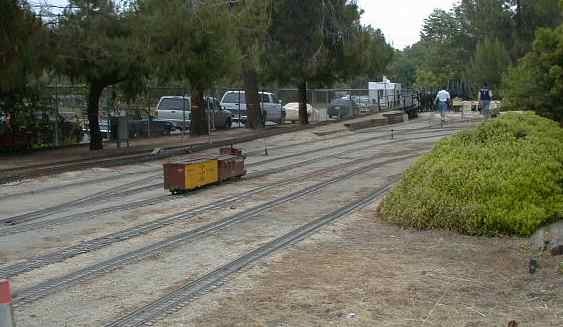 There are extensive facilities for the 1" scale trains too. This roundhouse and turntable had seen better days, but somebody has completely rebuilt them. 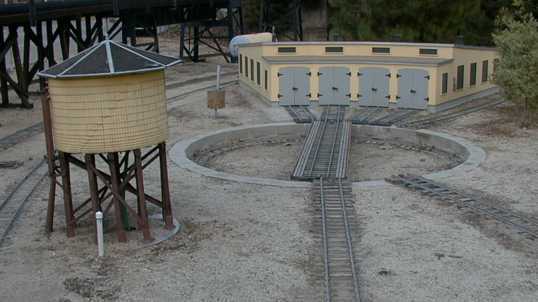 The roundhouse can be used to store equipment on site. There is also an transfer table for the 1" equipment. There was a car barn here as well, but it was in really bad shape. I expect that it is in the process of being rebuilt too. There are three full scale cabooses on the property. 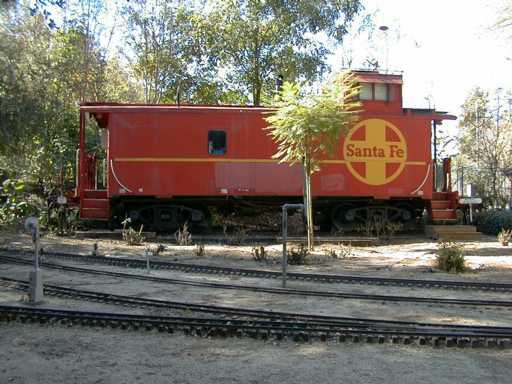 This ATSF caboose has been converted to a private residence for the full time caretaker of the facility. 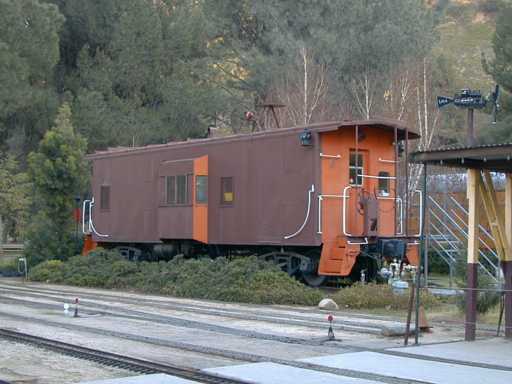 A UP caboose has been converted to a club room for club members. 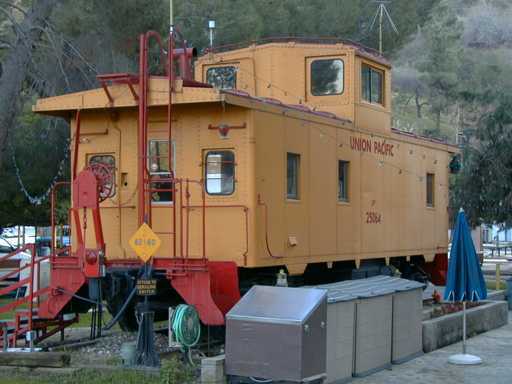 An SP bay window caboose has been converted to an office for the club's officers. The Disney company has been a supporter of the LALS. 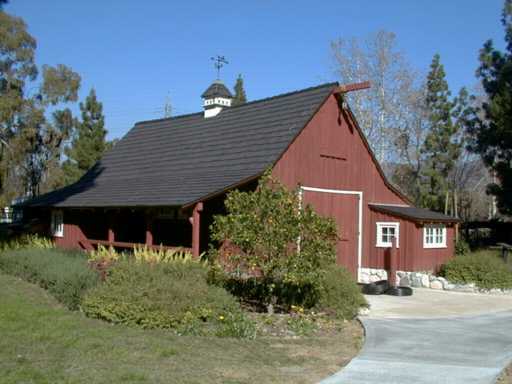 Walt Disney's barn from Carolwood has been moved to the LALS facility for preservation. 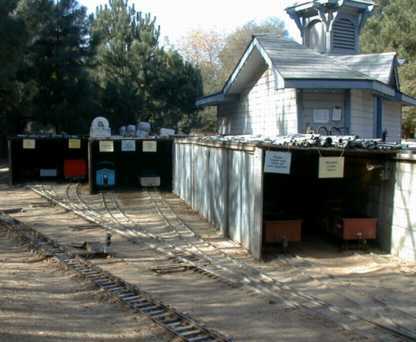 Walt used it as a workshop and a place to use his own model trains. The barn in open to the public usually on the 3rd Sunday of each month. 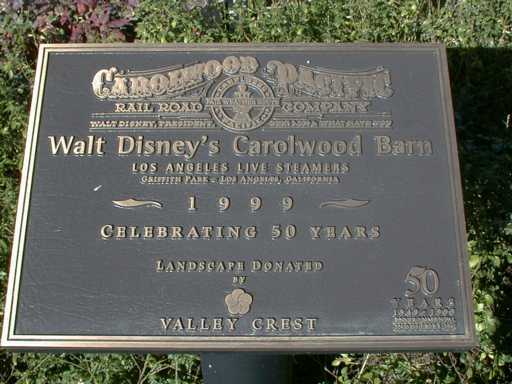 When the Disney barn was dedicated, this plaque was installed. 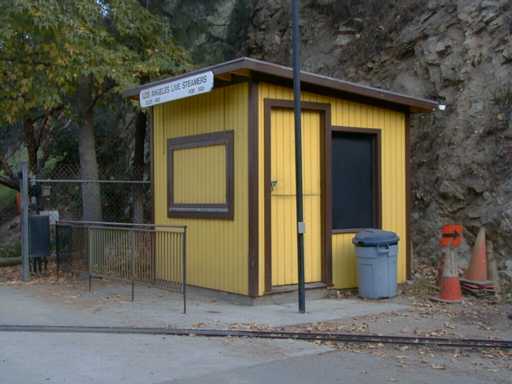 Next to the members entrance is a ticket shack. This building is used only during meets where the public is admitted to the grounds. Normally, the public enters at the other end of the facility at Sherwood Station.